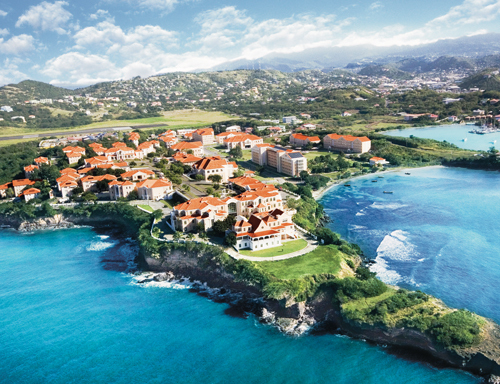 St. George’s University (SGU), located on the Caribbean island of Grenada, offers students the opportunity to earn an accredited MPH or a dual degree MPH/MD or MPH/DVM through its graduate global public health program. Students enjoy dynamic international classroom experiences and pursue practicum placements in more than 50 countries throughout Africa, Asia, Australia, the Caribbean, Europe, North and South America and the Pacific islands. The international nature of the MPH program includes active research collaborations with public health institutions such as the United Nations Development Program, Global Environmental Facility, World Health Organization, Pan American Health Organization, Centers for Disease Control and Prevention, National Institutes of Health, University of the West Indies and local and regional governmental and community-based agencies. The research and service activities of the MPH program include, but are not limited to, global health, climate change, renewable energy and sustainable development, occupational health, health care management and health services administration, diseases surveillance, non-communicable chronic diseases and the pursuit of the One Health, One Medicine concept.